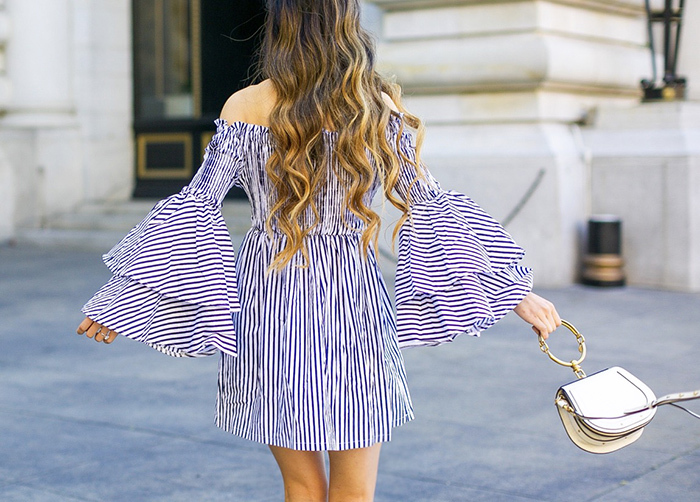 Don't you girls think this is the cutest off shoulder dress with the tiered ruffle sleeves? It's so feminine and flattering because of the shape. I'm madly in love. I want to recommend to you girls also because of the awesome price tag, it's less than $80!!! I'm super excited because it's Memorial day weekend. Do you girls have any plan for the long weekend yet? One thing I always do for you girls is I'm gonna share with you only the best sales for the weekend. Nordstrom is having an up to 40% off half yearly sale where you girls can get so many things on sale and wearing them now. I picked below items for you girls and they are all less than $100. Shopbop has more than 1000 spring items added to their sale. If you girls want to see which ones of my outfits are on sale, you can check out this post. I also picked a few more things for you girls today. Baublebar has up to 70% off. You girls know how much I love their earrings. Banana Republic has 40% off site wide sale with code BRSUMMER. H&M has up to 60% off with Free Shipping. Net-A-Porter has up to 50% off designer sale. You girls should check if you are lucky enough to find Stuart Weitzman boots. If you are looking for something for affordable, definitely check out sneakers and Sam Edelman shoes. Ssense has up to 50% off designer sale.